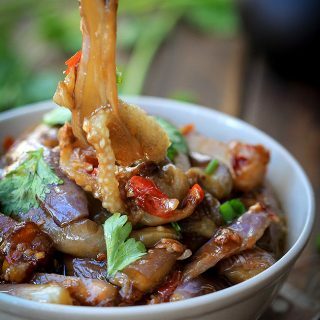 Chinese eggplant recipe–Szechuan eggplants(Yu Xiang Eggplant) is often listed as Chinese eggplant in hot garlic sauce. 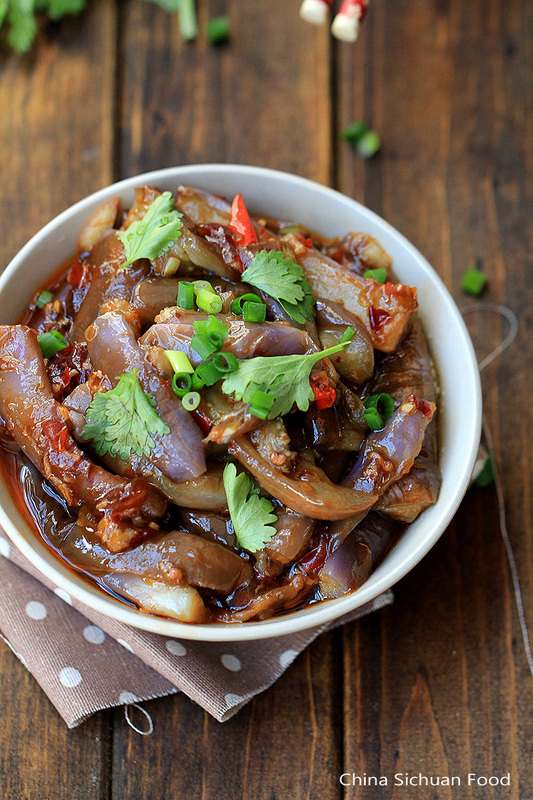 One of the representatives of Sichuan cuisine is Sichuan eggplant, or Yu Xiang Qie Zi(鱼香茄子in Chinese). “鱼香” actually means Fish-Fragrant, is a kind of flavor which is quite famous in Sichuan dishes. Besides Sichuan eggplant, there is the famous Yu Xiang Rou Si(鱼香肉丝 or fish-fragrant shredded pork). Some menu may refer this dish to Eggplants in Chinese hot garlic sauce. 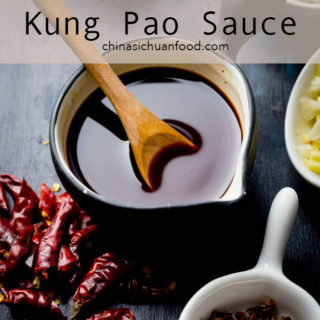 This unique fish fragrant sauce is made with pickled red pepper, garlic, ginger, scallions, salt, soy sauce and vinegar. It is firstly used to cook fishes. So this dish has nothing to do with fish meat. The best pepper used should be Sichuan pickled red pepper. 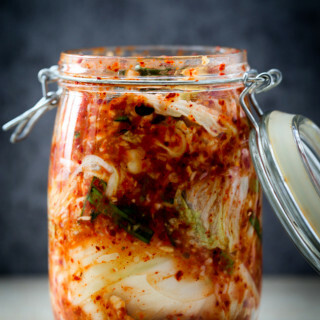 I have written a recipe about how to make it at home, if you are interested about this, please check pickled vegetables. Or if the pickled red pepper is really hard to find, you can replace it with Thai red pepper. 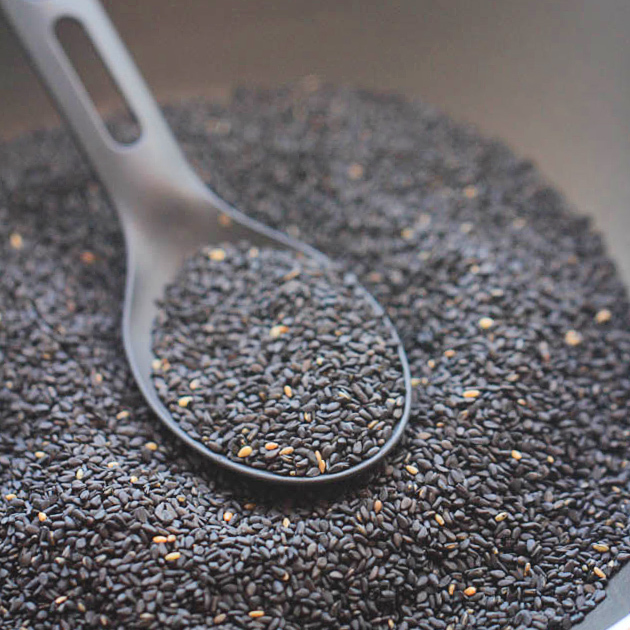 Although Sichuan peppercorn is commonly used in many Sichuan dishes, we do not need it for the fish fragrant series. I see many versions call for Sichuan peppercorn in this recipe. However, you may develop your own recipe and just enjoy the process of cooking. 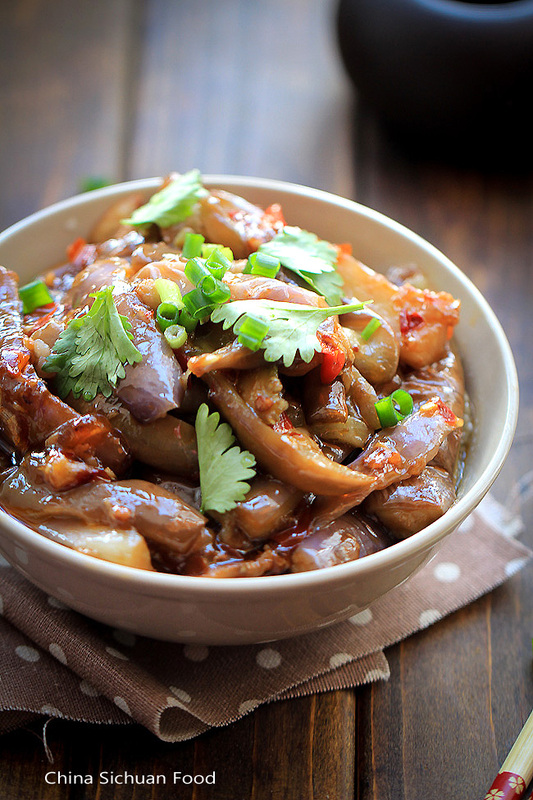 In restaurants, eggplants are usually deep-fried firstly before stir fry with seasonings. However homemade version usually use pan-frying. In order to reduce the oil absorbed during the pan-frying process and fasten the process, we should soak the eggplant strips in salty water for around 15 minutes. Stunning as usual. I love every way the Chinese make eggplants. I have a request…there is a cold eggplant salad we sometimes eat at school, in a restaurant we love, and in some very small restaurants (the really cheap ones that have no doors…just some tables). It is often served with sliced eggplant (cold) at the bottom of a dish and some sort of salty red sauce on top. In the restaurant we love it is served with a pestle (a stick) and we can beat it together. It is usually very spicy. Do you perhaps know this salad? If you do…do you know how to make it? Thanks for your help! We call that recipe as leibo eggplants usually with a server similar to a garlic processor. It is not difficult. I will post the recipe soon. I just tried this and it was really good! I added ground pork which I marinated beforehand in salt, pepper, and cornstarch. Thanks for the recipe! Thanks for your lovely feedback. I am so happy to find it works great for you too. Adding some ground pork is a nice choice. Good job on this one. Really helpful especially the bean paste ingredient which on most sites I checked wasn’t mentioned. 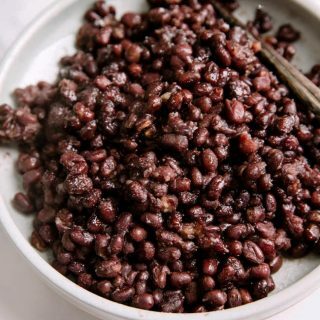 Your post solved my problem on how to make this recipe reddish in color (thanks to the magic ingredient- bean paste) . My husband and I love this pickled mushroom salad (cold dish) served in a Sichuan restaurant we frequent. Mushroom is black in color and looks flowery. Tastes sour and very spicy, garnished with chopped coriander. I’d appreciate if you can share a recipe on this. Thanks for contacting. Is it wood ear mushroom salad? 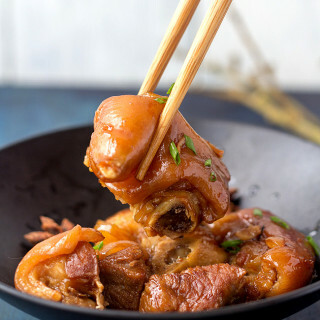 Similar to this one https://chinasichuanfood.com/marinade-wood-ear-mushrooms/? Made this for dinner. It was as good as any eggplant I’ve had at a Chinese restaurant! Thanks Claire!! Glad to know it works out fine for you too. Happy cooking! Thanks each time i do this recipe the appearence is different And taste as Well.but il is always mouth cutting (my on Way of saying too good ). And each time i went to china my colleagues do not ask me what i want. They Just bring me to any restaurant serving eggplant amongst other. Thanks again for helping me doing it at home. Mouth cutting is such a lovely description. We have similar words like rice killer. 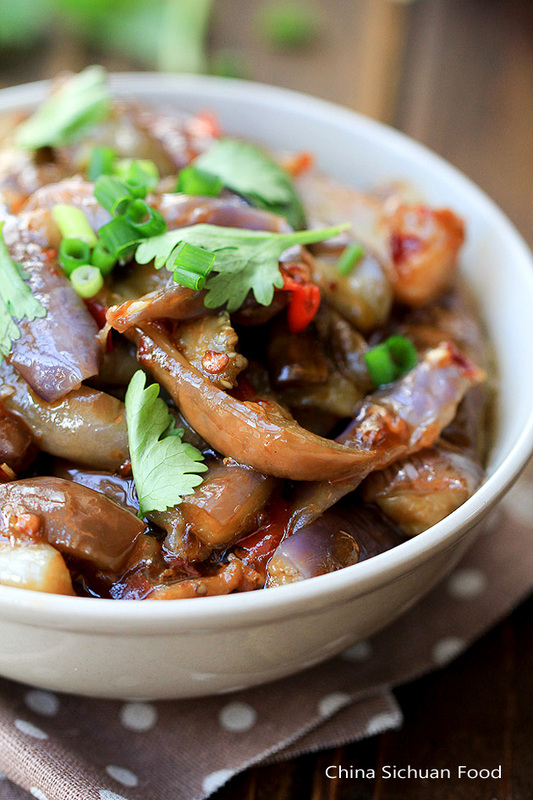 Eggplant is really great with Chinese style cooking. Just made this. Was excellent! Thanks for your lovely feedback Kyrie! So glad to hear that. Hi Elaine you’re a life saver.All my favorite food from china is here.I lived in china for 6 years and I loved every bit of it and the food my gosh..It’s heaven.I was searching for some authentic food channel on YouTube but really not much of help then I found your blog.Thank you very much Dear. This is one of my favorite Chinese dishes. Unfortunately, most restaurants here in the U.S. dip the eggplant in batter and deep fry it. The coating gets soggy and the whole dish is ruined. It’s been quite a while since I’ve made it at home, but seeing your recipe has inspired me to do so again. Thanks! Made this tonight, trying to reproduce my favorite “fish flavored eggplant”. And this very good and delicious, but not quite enough spicy! Next time I’ll add red chili oil. Excellent recipe. I’m in love with your site. Thank you. J’ ai mangé dans un petit restaurant très typique à Xing Ping du “gi xiang gié zj” traduit par notre guide en “aubergines parfumés.” Elle m’a expliqué qu’il fallait passer les aubergines en mandoline pour faire une sorte de spiral, rouler l’aubergine dans une sorte de pâte sablé (beignets?) avec des épices. Est-ce que vous connaissez cette superbe recette? Sorry I cannot provide only further information concerning about the dish you mentioned here. Can you drop me a picture? 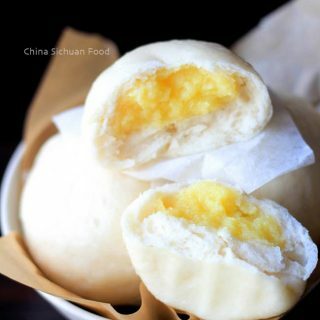 If I cannot buy doubanjiang, do you have a recipe please? I do. 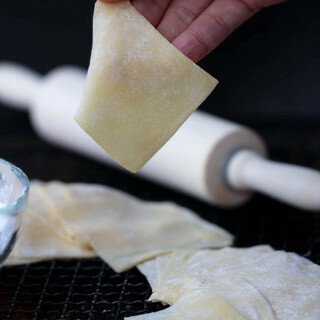 You can check the post introducing how to make doubanjiang at home. But it is not the right season now.